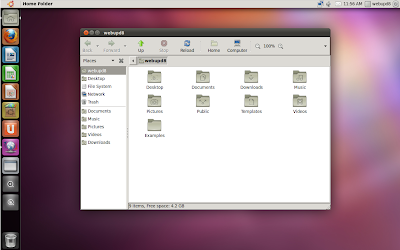 It seems that quite a few Ubuntu 11.04 / Linux Mint 11 users are having an issue with GNOME loading without a theme (instead of your GTK theme you get a classic, Windows-95-like grayish theme). According to an AskUbuntu question, this can manifest in other ways too like the GNOME theme being applied correctly everywhere except for Nautilus. This issue is caused by a "race condition between the GDM and session calls to gnome-settings-daemon" which can cause GNOME to load without a theme and thus defaulting to the gray theme you see in the screenshot above. A fix for this is specified in the Linux Mint 11 known issues but in case you've missed it, here's how to fix this (this also applies to those having this issue while running Ubuntu 11.04 Natty Narwhal in Virtualbox). This is not related to the Ubuntu 11.10 broken GTK3 theme, that's a different issue! Exec=bash -c "sleep 5; /usr/lib/gnome-settings-daemon/gnome-settings-daemon"
What this does is add a few seconds before running gnome-settings-daemon. Please note that for me, 5 seconds was enough but the Linux Mint 11 known issues section states that in their tests they've found "20" to be an optimal value, so if 5 doesn't work for you, try changing the value to something larger. Once you change the file, save it and restart. Thanks to Linux Mint 11 release notes for the fix!